Clementine, a third grader, lives with her artist mother, her father who manages the apartment building where they live, and her three-year-old brother Spinach. Or Radish. Or is it Rutabaga? Pea Pod? Well, whatever his real name is, it's not a food. Clementine got stuck with a fruit name and the only thing worse than a fruit name is a vegetable name, so Clementine's collected lots of vegetable names for her brother. On Monday she ends up on the principal's office. Something about Margaret's hair. On Wednesday Clementine's plan to make Margaret feel better plops her back in the principal's office. Something about Clementine's hair. "Clementine! What have you done?" asks Mrs. Rice. "Wow! Clementine and Rice! We both have food names!" Clementine responds. You see, Clementine always pays attention. It's just that adults seem to believe she should be paying attention to something else. Okay, fine. But Clementine's week gets better, even though Friday's breakfast eggs had clear parts in them. She is promoted to captain and then sergeant in the Great Pigeon War. She doesn't miss her cat, Polka Dottie, quite as much. Margaret and her mother are even coming around. And, believe it or not, her parents aren't getting rid of her, even though she overheard them say, "One's all we need." Judy Moody. Ramona Quimby. Make room, ladies. There's another young lady on the block. And she fits right in! 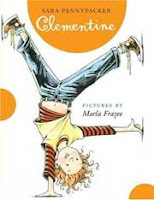 Other Clementine books: The Talented Clementine and Clementine's Letter. Thelonious Chipmunk lives in his own place on the river in the Untamed Forest. Even though he's grown he still believes in the old legends of humans. There was a time, the legends say, the time of Human Occupation, when humans lived and animals only spoke in the low language of grunts and growls. Thelonious keeps a human artifact, a large photograph of a tall building created by humans. But the old legends are just myths. When a storm comes and washes away Thelonious's tree, he struggles to survive in the raging flood waters until he washed up on the shores of the City of Ruins. Where he learns there is truth to the old legends! Nearly tricked by one of the Dragon Lady's lizard spies, Thelonious escapes and luckily finds a friend in the city. Fitzgerald the porcupine lives in a library. He introduces Thelonious to books, canned food, electricity, and clothing. The two go to meet Olive Bear - a flying bear! - and the three plan to get Thelonious and Olive back to their homes. The three face attacks from the Dragon Lady's ratminks and the mysterious mist of the Fog Mound, Olive's home. The group grows to four and then five with two surprising additions as the travelers try to reach the Olive's peaceful home atop the Fog Mound. Travels of Thelonious is written in a unique way. Chapters alternate between traditional novel and graphic novel. 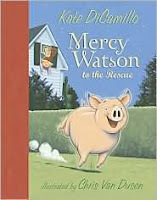 Oversized and 214 pages long, the book seems daunting at first glance, but young readers find themselves moving quickly, especially through the comic book chapters. 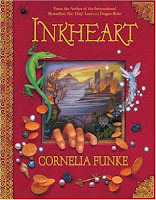 Inkheart has everything for book lovers. Twelve-year-old Meggie is a reader who, when told to pack a few necessary items, first packs books. Her father, Mo, repairs old books, reattaching loose pages and covers and bindings. Their house has books everywhere. Early on we learn that Mo has a special, mysterious talent. 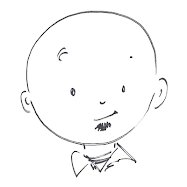 He and Meggie both love to read, but when Mo reads aloud – something he no longer does, ever – items and characters from the book come to life. Something from this world, however, then disappears into the book. But where his wife, Meggie’s mom, has gone is a mystery. Years ago, Mo read Dustfinger out of Inkheart. Dustfinger, who calls Meggie’s father Silvertongue on account of his magical skill, wants to get back into his world…back into Inkheart. But Mo refuses, terrified that something or someone else he loves will disappear. When Dustfinger arrives one rainy night and announces that Capricorn wants the book too and will kill Mo to get it, what follows is an adventure full of chases, double crosses, stolen copies of Inkheart, and travels between fiction and reality. By the way, about Capricorn. You know how authors create really nasty characters? The baddest of the bad? Characters willing to do whatever evil, wicked, or murderous thing necessary to get what they want? That’s Capricorn. And he’s now in this world too. There’s more characters and settings and mysterious circumstances than I can mention here. The best way to experience them all is to read yourself into this wonderful book.